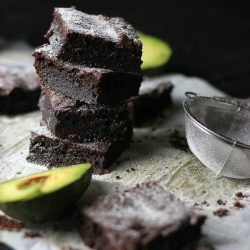 These delicious keto avocado brownies are the creamiest and fudgiest low carb brownies you’ll ever make! These incredibly easy to make chocolate brownies are dairy free, gluten free and sugar free. They can also easily be made nut free! Adding avocado to baked goods, especially chocolate treats, ensures that your chocolate cakes become extremely fudgy, gooey and creamy. 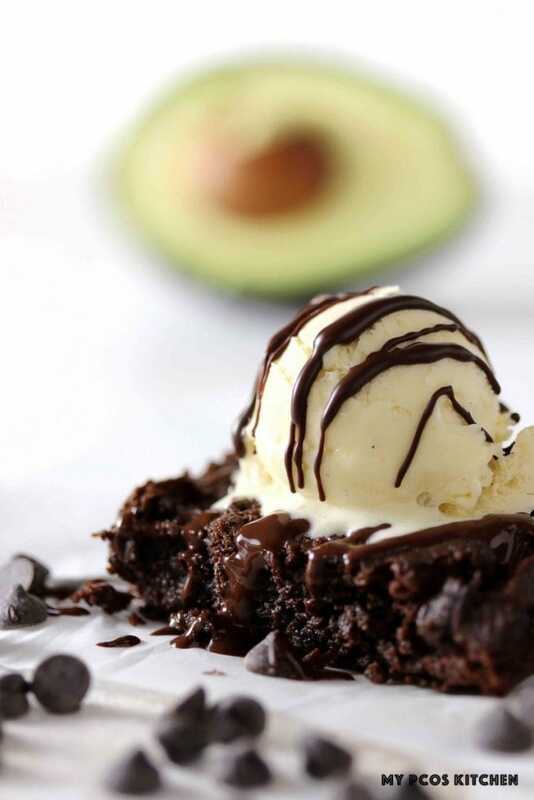 These fudgy avocado brownies are superb on their own, and even better served with some low carb ice cream and a drizzle of melted chocolate. 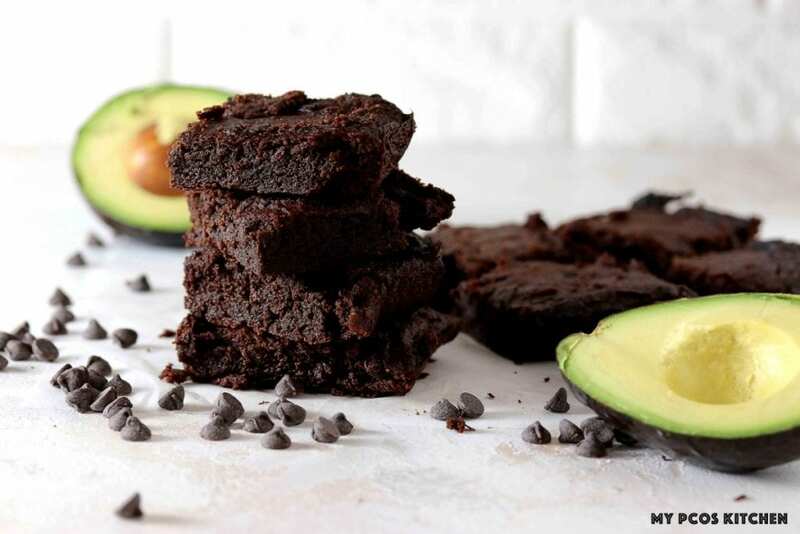 For this keto avocado brownies recipe, adding avocado was the key to make the batter hold together. 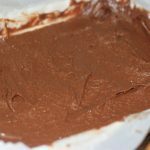 If you’d like to try an avocado-free brownie recipe, you’ll need to try my keto chocolate cake recipe made with psyllium husk powder. The psyllium helps make everything stick together and keeps the cake super moist and fudgy! How many carbs are in these Keto Fudgy Brownies? These keto brownies are sweetened with a mixture of erythritol, stevia powder and melted chocolate from Lily’s. You’ll want to subtract the sugar alcohols from the chocolate and the erythritol to get an accurate net carb count. This recipe makes 12 brownies and each brownie has 2.8g net carbs. Each brownie has 9.78g carbs, 5.2g fiber, and 1.78g sugar alcohol. What are the Best Sweeteners to Use? You have several low carb sweeteners to use for these low carb brownies. Your options include erythritol and stevia, erythritol and monk fruit, Lakanto Golden, Sukrin Gold or Xylitol. I personally like to use a mixture of granulated erythritol and stevia powder extract from NOW since they don’t leave any bad aftertaste. Instead of stevia extract powder, you can use monk fruit extract powder. They both have the same sweetness. Why Did I Use Stevia & Erythritol? Erythritol tends to crystalize once it’s cooled down and too much of it gives you a cooling sensation. I always use a little amount of erythritol combined with either stevia or monk fruit so that the erythritol can give the bulk, but the stevia can give the sweetness. I don’t recommend using Swerve for this stevia brownies recipe as I had a huge cooling sensation and headache after eating one piece. Although that might just be a personal reaction to Swerve since it always gives me a headache. If you don’t want to use stevia powder or monk fruit powder, you can also use Lakanto Golden or Sukrin Gold to make these brownies. Lakanto has added monk fruit extract powder added to their erythritol and Sukrin has added stevia extract added to their erythritol. Yes, you can! 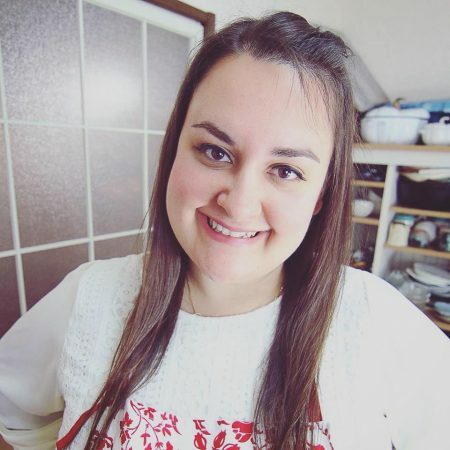 The brownies actually come out really good with xylitol, but I prefer not to use it in any of my recipes because (1) it raises your blood sugars, and (2) I have a dog. Xylitol is lethal to dogs so I am really careful not to have it in my house since I have a little chihuahua. Even a tiny teaspoon can kill a pup, so be extra careful (if you do own a dog)! I have made these chocolate brownies with xylitol, though, and they are absolutely amazing! Xylitol doesn’t leave an aftertaste and doesn’t crystalize in the fridge so it is a good options if you don’t have a dog. Here are some substitutions I have tried for different sweeteners. 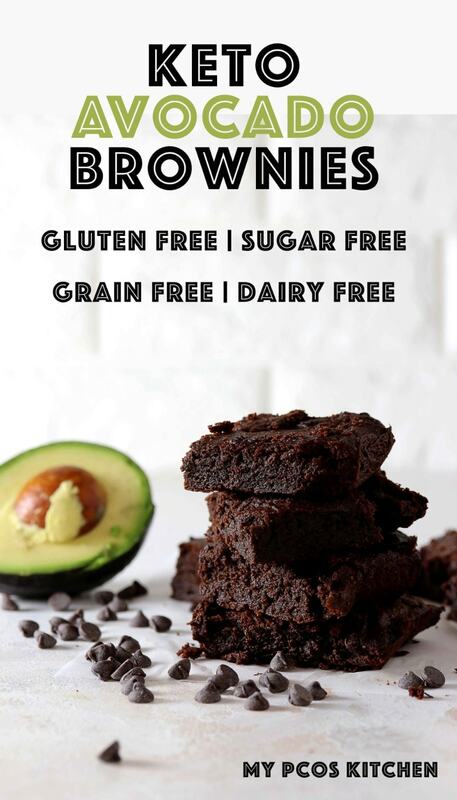 You can use any of these combinations to make your sugar free brownies. Can these paleo brownies be made with sugar? Yes, of course. Simply replace the sweeteners for 1/2 cup of maple sugar or coconut sugar to make some paleo friendly brownies! Can these Keto Brownies Be Made Nut Free? Yes! These low carb chocolate brownies can easily be made nut free! If you have a nut allergy, or can’t eat nuts, then this brownie recipe can easily be made nut free! I’ve tested the recipe with coconut flour and was able to create the same texture and taste as the almond flour version. 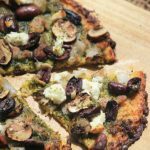 All you need to do is replace the almond flour with coconut flour, but in smaller amounts. If you want to make these low carb brownies nut free, simply switch the 3/4 cup (90g) almond flour for 3 tbsp of coconut flour. That’s all. What’s the Best Fat to Use? I personally used refined coconut oil in order to make these dairy free. I recommend using refined coconut oil and not extra-virgin coconut oil so that you do not get any coconut taste in your brownie batter. Instead of coconut oil, you can use ghee or butter. Any type of fat will work for these brownies. 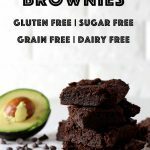 How Long Should I Bake these Sugar Free Brownies? You don’t want to bake these brownies for too long since you want to keep them as fudgy as possible. 30 minutes should do the trick. I’ve tested baking these healthy brownies for 15, 20, 25, 30, 35, and 40 minutes. At 25 minutes, the brownie batter was still raw in the middle, and at 35 the brownie batter was a little thick, like chocolate cake. In order for you to make the most fudgy brownies ever, you’ll need to bake them 30 minutes. How should I check if they’re ready? Usually you would insert a toothpick inside the middle of the cake to see if it comes out clean, but this time you still want the toothpick to come out with a bit of batter stuck to it. 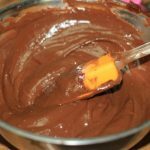 This is important so that these keto brownies stay as fudgy as possible. If you touch the middle of the cake, it should still be soft, but not raw and not hard. You’ll also need to let it cool down to room temperature for the low carb brownies to finish baking. Avocados greatly differ in size and the ones I used in this keto brownie recipe differed each time I made the recipe, which is why I prefer to weigh them. The first time I made this recipe, 2 avocados weighed 250g, but the second time I made this recipe, 2 avocados weighed 340g. Noticed that 90g difference? That will certainly affect the taste of these keto avocado brownies and they will become more bitter. Just remember that 250g of avocado equals 1 cup of mashed avocado. The first thing you’ll want to do is to weigh your avocados. I prefer to weight them because adding too much avocado into these keto brownies will turn them bitter. If you don’t use grams in baking, 250g of avocado equals to exactly 1 cup of mashed avocado. Once you’ve measured your avocados, you’ll want to smooth them out in a food processor. If you don’t have a food processor, you can try to use a stick blender. If you don’t have any electrical equipment, you’ll have to either use a fork or a potato masher to mash the avocados as best as you can. You want to cream your avocados as best as possible to ensure you don’t get any avocado bumps in your batter (not so yummy). 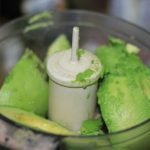 Once your avocado has been creamed, you’ll then add all of your wet ingredients one at a time to the blender to make sure everything gets mixed correctly. Add the dry ingredients to the food processor and process until a smooth, but thick batter is created. Note, this batter is not pourable. You’ll have to spread the batter all around your baking dish. Prepare a 12×8″ (20x30cm) baking dish covered with parchment paper. Transfer the chocolate brownie batter to the dish and spread evenly. If these low carb avocado brownies got you hooked on desserts made with avocado, then you’ll have to try my avocado lime cheesecake! It’s a no bake cheesecake made with avocado and lime and it’s the best thing on Earth!! Before making these gooey chocolate brownies, you’ll want to read the following tips to make sure you get the perfect batch of brownies each time! Weigh or measure your avocados to make sure you get exactly 1 cup (250g) of avocado. You don’t want to have super bitter brownies from too much avocado! For a nut free version, simply replace the 3/4 cup (90g) almond flour for 3 tbsp coconut flour. Make sure to use sugar free chocolate chips. I recommend the ones from Lily’s as they are dairy free and sugar free. You can use any type of fat you want. Butter, ghee, avocado oil, coconut oil or shortening will work! 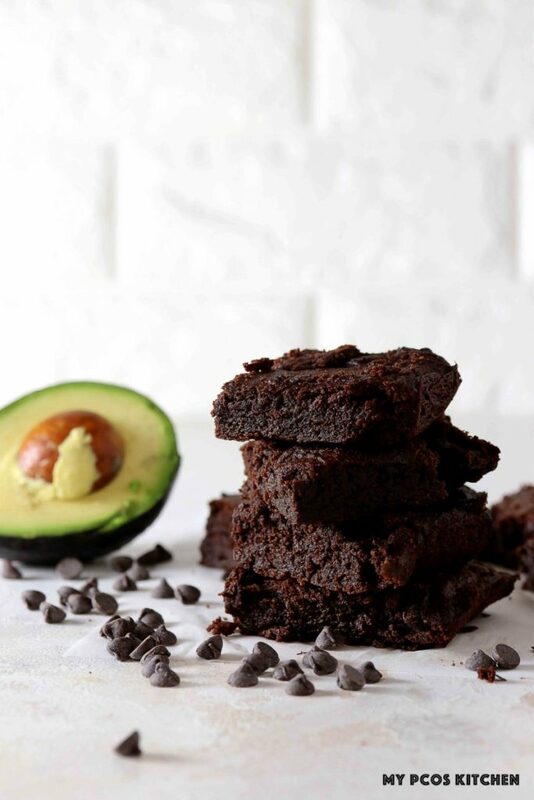 You have multiple options for sweeteners when making these low carb avocado brownies. Make sure to not over bake these brownies! 30 minutes in the oven at 350F/180C will be the perfect amount of time to have the ultimate fudgy brownies! For a paleo version, simply replace the sweeteners for 1/2 cup of coconut sugar or maple sugar. The BEST keto brownies you'll ever make! 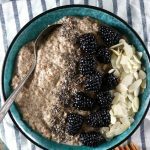 Gluten free, sugar free, dairy free and can also be made nut free! Seriously, they're the best! In a separate bowl, combine the dry ingredients together and whisk together. Peel the avocados. Weigh or measure your avocados. Place in a food processor. Process until smooth. Add each wet ingredient to the food processor, one at a time, and process for a few seconds until all of the wet ingredients have been added to the food processor. Add the dry ingredients to the food processor and mix until combined. Place a piece of parchment paper over a 30x20cm (12''x8'') baking dish and pour the batter into it. Spoon evenly and place in the preheated oven. Bake for 30 minutes, or until a toothpick inserted in the middle comes out half clean. The top should be soft when you touch it with your fingers. Take out of the oven, let it cool completely before slicing into 12 pieces. *1 For different sweetener substitutions, here are some possible options. Replace the 90g (3/4 cup) almond flour for 3 tbsp coconut flour. Do these need to be refrigerated or left on the counter? Hi Teresa, they need to be refrigerated since there’s avocado in there. Thanks for sharing the recipe! Anyway I could just use stevia without the addition of other substitutes?? Hi D’Ava, stevia alone would make these brownies way too bitter and you would be missing the bulk needed with the erythritol. Made these today, weighed the avocados and turned out to not be 2 full avocados. I followed the directions exactly, but substituted Truvia for erthyitol. I used Extra brut cocoa and added an extra tablespoon. The batter was so good, it almost didn’t make it to the oven! I put it in the recommended dize pan, but they seemed really thin. I think an 8 x 8 would be a better size. There is always next time! 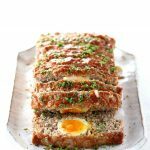 Do you think I could make these without eggs? And use flax eggs? Or?? Hi Amy, I’m not too sure as I’ve never baked without eggs. That’s not really my area of expertise. Thanks for all the variations re alternative sweeteners. Yum! These brownies look great! I have to admit, I’ve never tried baking with avocados before. I really want to after seeing this recipe, tho. It sounds amazing! I tried the recipe and am hoping for the best-All of the conversions and difficulty finding even preheat temp. The batter is really good and chocolaty so I’m hoping for the best. These are so rich, fudgy good and decadent! 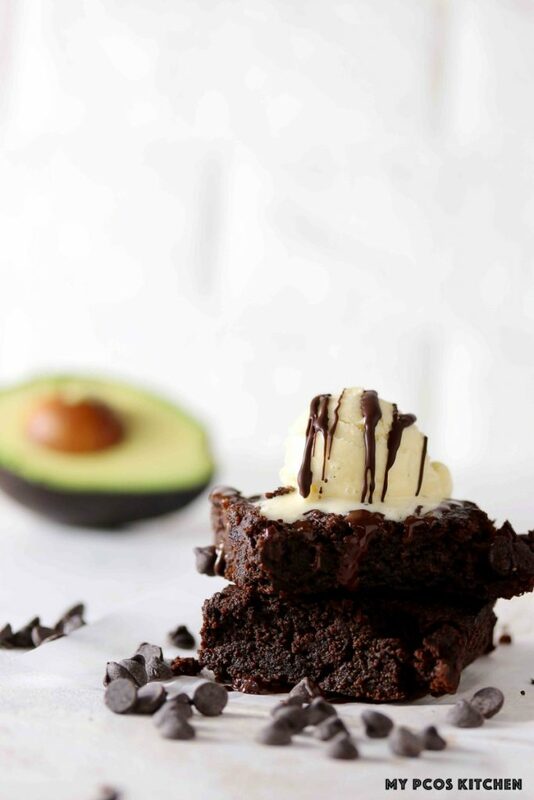 Love chocolate brownies made with avocado! Totally going to make it!